Google’s Search Engine is without a doubt the gold standard of search engines on the internet today – so naturally, when they change something in their algorithm’s, everyone snaps to attention and adjusts accordingly. If you haven’t heard yet, Google has recently done just that. Frequently updated content is more important now than ever as Google is now placing a heavier emphasis on more frequently updated content over older, perhaps more popular, content. Having dates in EVERYTHING you produce is important. So if you are not writing regular content for your site — it’s time to invest in a content creator who can do this for you. Keyword rich content is KEY because Google is now creating “snippets” of your page content (excluding header and menu content) – but be warned, using frivolous or non-applicable keywords in your content will land you in hot water with Google’s new algorithm. Links in Headers, Footers and Blog-Rolls will no longer help Search Engine Optimization – if it isn’t in the main content body, it doesn’t exist to Google. Less emphasis is given to links with duplicate anchor text. In fact removing duplicate anchor texts will actually be a great move to help increase your SEO ranking. This means you no longer want to just have incoming links use a single phrase for anchor text (which if you are unfamiliar with Anchor Text, it’s what I did just above on the words “SEO Ranking”), but rather a spectrum of synonyms and related phrases (Again, I anchored Search Engine Optimization and also SEO in this post). User reviews are now going to be incorporated into product searches along with product price and description making it all the more important to have great feedback for your products and, perhaps in the future, services! Google is now placing a larger emphasis on author names associated with blogs and insuring that content is UNIQUE – not just random spam. Content Farms have finally met their match! Have you noticed an increase in websites in the top listings of Google that are really nothing short of glorified spam-sales-pitches? You can typically spot these sites because they have the long “sales letter” format and love to utilize highlights, lots of headers, bold words and even flashing attention grabbers. These sites normally flood their URL with backlinks through excessive article distribution – while some is good, these guys take it to the extreme and ALL of the anchor words are normally the same. The exorbitant backlinks combined with all of the anchor text words being the same are now huge red flags to Google — and lucky for us, these sites are soon to be sent packing to page 10+ of results. 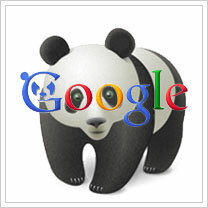 Most of the research I have done on this though – aside from the new PANDA Algorithm – is saying that these updates will have less impact on the US markets than it will on the non-english speaking countries using Google Search. Though of course it is still good to consider since Google often tells us something doesn’t really apply… even when it does.